The Center for Sustainable Landscapes at Phipps Conservatory and Botanical Gardens is a recipient of the 2016 AIA COTE Top Ten Green Projects Award. Conceived as a building that provides both a home for administrative and classroom functions, as well as a tool to further the institution’s mission “to advance sustainability and promote human and environmental well-being through action and research,” the concept and design brought together many Pittsburgh- and Pennsylvania-based firms to create this skillfully crafted solution. Designed by The Design Alliance Architects, the project team also included Andropogon Associates, Ltd., evolveEA, 7group, Massaro Corporation, Civil and Environmental Consultants, Atlantic Engineering Services and CJL Engineering. Other team members included Turner Construction, Indevco, Carnegie Mellon University, University of Pittsburgh, and Vermeulens. According to the American Institute of Architects (AIA) and its Committee on the Environment (COTE), “The AIA COTE Top Ten Awards program recognizes exemplary and innovative built projects that establish an overall design excellence that creatively integrates sustainable design strategies, demonstrating their benefits while educating and inspiring the profession and the public.” The CSL afforded an extraordinary opportunity to make a concrete demonstration of the positive impact that buildings can have on our environments. The CSL is the first and only building to meet four of the highest green certifications: Living Building Challenge, the world’s most rigorous green building standard; LEED® Platinum (tied for the highest points awarded under version 2.2); first and only Four Stars Sustainable SITES Initiative™ (SITES™) for landscapes project (pilot); and the first and only WELL Building Platinum project (pilot). 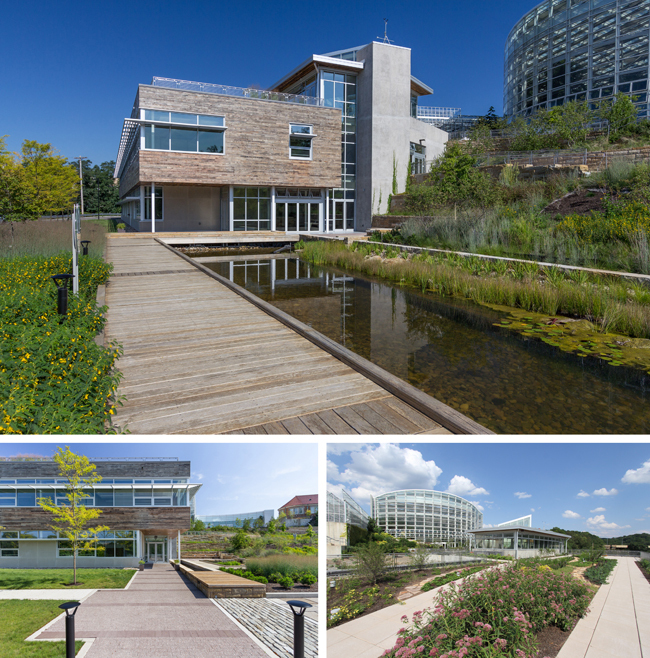 The Center for Sustainable Landscapes was also awarded an AIA Pittsburgh Green Design Citation in 2013 for the way the design met its aggressive sustainability goals with solutions that are skillful and on display for instruction. All of the Top Ten Green Award projects will be honored at the AIA 2016 National Convention in Philadelphia on May 19-21, 2016.